The Actor’s Studio is a sister organization of renowned theatre group Pratiwimba, an innovative group established in Pokhara, Nepal in 1990. Actor’s Studio has been offering 3 month intensive trainings for the past 5 years, using an interdisciplinary approach, based on its faculty of writer, visual artist, musician, designer, graphic artist, anthropologist, and actor. The mission of Actor’s Studio is to explore and expand multi-culturalism in theatre and its dynamics. They believe that theatre can stimulate human sensitivity and enrich the imagination in ways that provoke people to be part of social transformation. 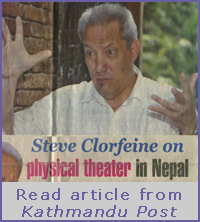 Actor’s Studio has been performing plays in Nepali and other languages continuously for the past 15 years. 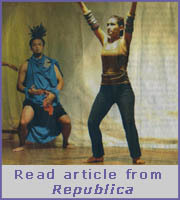 They have performed on stages, in the streets, and in village squares, in an effort to raise consciousness on social issues with plays relevant to people’s lives. 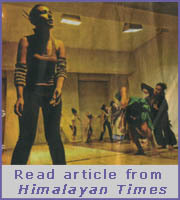 The company has performed in India, Japan through commissions and festival invitations. I met the director, Anup Baral, in 2004, while presenting workshops at Arohan, Gurukul, a residential theater and training in Kathmandu. His familiarity with contemporary world theater and film struck me at once, and moreover, his innate interdisciplinary style, as poet, visual artist, actor and director, resonates with the approach to theater which I’ve worked with throughout my career. We’ve been collaborating on workshops, trainings, and ideas for performance for the past 5 years, and in 2009 we have a Cultural Envoy Program grant from the U.S. government through which I will offer a 3 week theater training to Actor’s Studio and regional performers.